Last week, a friend wrote a wonderful post about bad dogs. I could relate to every word - I've always been attracted to the more complicated, independent types. My first dog was a Chow/German Shepherd mix, and she was nearly perfect because she had an incredible nature, not because she did anything I asked. While I appreciate discerning temperaments, selective hearing, creative hobbies such as freestyle landscaping and trash can physics, I know that not everyone sees the beauty of the free dog spirit. Wild is the thing we've been selectively breeding out of our canine companions for centuries. As the guardian of a challenging, reactive dog, I'm hyper-aware of my responsibility to keep her safe and thereby keep others around us safe. I'm sure that the people who see her spinning and barking on our walks don't think she is a well-trained dog, and may have their own opinions about me and my training abilities, but they don't know the full story, the effort I've put in, or the fact that even professional trainers have declared her "a tough case." What I know is that I take many steps to manage her reactivity. I keep her on leash, I employ safety methods such as equipment backup and two forms of identification. I installed window film to keep the peace in a complex with an increasing number of dog neighbors. Ultimately, I am responsible for every positive or negative experience that Ruby has. As an advocate of positive reinforcement, I am also responsible for living up to the tenet of "Do No Harm," even if this means risk of embarrassment or refuting the advice of someone who suggests I use training methods I don't believe in. I am responsible for identifying which behaviors are simply annoying and which are potentially dangerous. I would love for Ruby to be seen by outsiders as the dog I know and adore, but I refuse to skip steps or compromise my training values just to look good. Positive training is a work in progress and I never want to stop learning or grow complacent. I can always do more. The winter months and early dark make it difficult for both dogs to get a decent walk, let alone one-on-one leash-walking training time. I have been having some success in redirecting Ruby to sit when she sees a car, and eventually I'd like to be able to employ this with her more formidable triggers. Her lack of recall has led to some scary incidents, and with the advent of a long line, I want to focus on improving this when the weather allows. I've also installed what I hope is a backup plan in that I've taught a "run home" cue that we practice on leash. Ruby is my squirrely girly, and Boca's recent trips to the vet have emphasized the importance of a cooperative patient. To encourage Ruby to be more receptive to handling, I have been working on a "tag" cue which is essentially a verbal indication that I am going to touch her and she is going to get a treat. I love trick training, so it's great when we can find practical applications for learned behaviors. Ruby is my responsibility, and through positive training methods, I am working toward helping her be a little less wild. 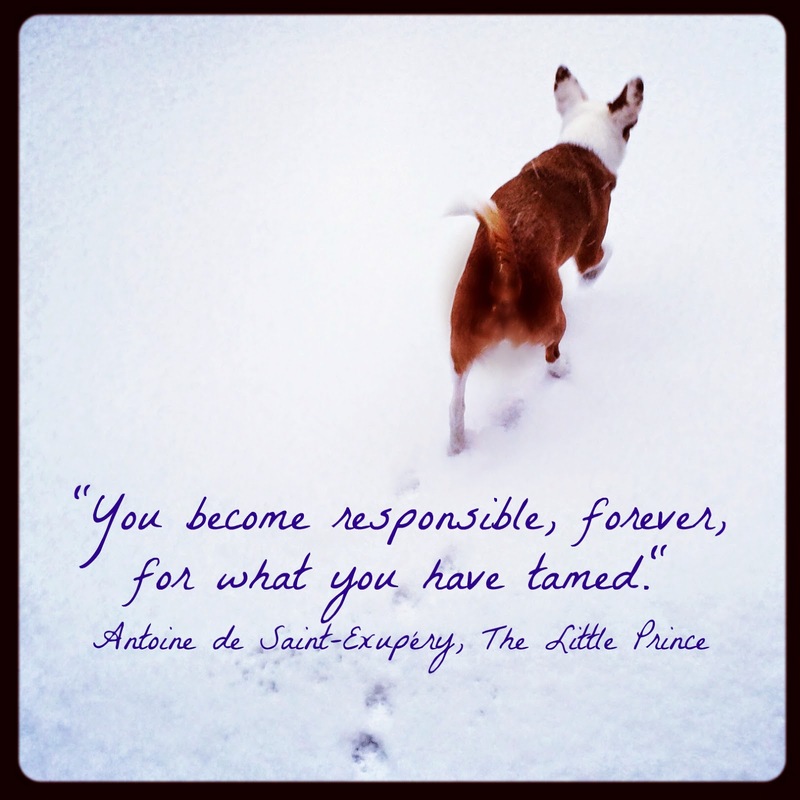 February is Responsible Pet Owners Month, and as part of the Positive Pet Training Blog Hop along with Cascadian Nomads and Tenacious Little Terrier, I invite you to share your posts about how responsibility relates to training, or any other positive training topic! It's something I find fascinating, and like you I take steps to manage my dogs reactivity and fearfulness, and it's led to such a great bond. Thank you for the inspirational post. The study suggestion makes a lot of sense to me...maybe because we feel even more strongly like we are our fearful dogs' protectors? I am starting to notice Ruby calming down as she gets older - I can only imagine what our relationship will be like as the years go by! We tend to lean toward fearful dogs too. I think people who truly care about animals tend to gravitate toward them because we can't abide animals being pain or fear and we want to solve it. Turning both of my fearful dogs into social butterflies and trusting souls was, to me, the most fulfilling thing I have ever done. And what I try to get people to understand was that training was a huge part of it. Positive reinforcement training is what made them confident and happy and brought them out of their shells. That's fascinating Jen, and I believe there is some truth to that. At least those of us with reactive dogs are sympathetic to the others that we see - honestly, more often than not when we encounter other dogs on walks they are in a hurry to turn the other way with their barking dog, too! It is such a common issue. My bad dog Reno, was one of the most wonderful dogs I've ever had the pleasure of sharing my home with. The day he could spend some time with my grandchild without worry was an awesome experience. Love me some bad dogs. What kind of a dog was Reno? They sure do wedge themselves into our hearts, badness and all, don't they? I too am still work in progress. I hope to get as good as some of my dog training friends whom I admire. Your love and devotion is so inspiring - thank you for sharing! Thanks so much - Ruby is such an endearing little dog, she is easy to love. One of my dogs is slightly reactive. Not terribly so, but just enough that I can image the challenge of having a truly reactive one. My Norwegian elkhound was dog-reactive on leash...I thought she was challenging until I adopted Ruby, who is everything-reactive! It is nice that I have Boca to balance things out, and remind me what a relaxing dog walk can be like. In my post today, I wrote how I was so excited that Luke took to my friend. One of the biggest reasons for that was because I want others to see what a loving and sweet dog he is, not the barking crazy dog that greets them when they come to the house. I feel others' judgment and I hate that. Through working with Luke I feel so much closer to him and like I understand him so much better. I'm not sure my hubby even realizes that, and trying to convince him that training needs to be ongoing has been very difficult. He still thinks that yelling at Luke should be enough to stop the behaviors he doesn't like. So yes, my hubby is an ongoing project as well, and far more difficult to train than Luke is! Since Ruby is my second reactive dog I had a head start in not caring what other people think, but sometimes it still gets to me. You are right that people can be tougher to train than dogs! I'm so happy that you are seeing positive results with Luke! Window film - Eureka! I once had a trainer suggest I give Henry a 'bop' on the nose to teach him to take treats gently. That was the end of her!!! The window film was a life-changer! Good for you for high-tailing it away from a trainer promoting physical punishment. I love this post! I also love my "bad dogs", even though people constantly question why I enjoy a dog (mainly Nola) who keeps me on my toes 24/7. I agree that you're constantly progressing when you use PR. It can be stressful to the handler to be a bit embarrassed by their dog, even when taking the proper positive steps to teach the right behavior. Kudos for sticking with it! Their needs to be more of us who use it. There is just something about them, isn't there? I like my horses a little on the ornery side, too. I spend a lot of time thinking about the good dog/bad dog dichotomy. All my previous dogs would be considered "bad" and Honey is certainly good. But both kinds of dogs benefit from serious training. It's what builds our relationship and allows our dogs to life their fullest lives. BTW, I also enjoyed your friend's post. But it has made me think I might need to push back a little in a future post of my own. I suspect that some people who dismiss goldens and the like as boring people pleasers are seeing the dogs through a particular lens that does not take into account that dog's unique nature. Pamela, you always have such a great balanced viewpoint. I agree with you that "good" dogs need training, too, and admit I am a bit of a slacker when it comes to training my laid back island girl. She comes when she's called - what more do I need? Fantastic viewpoint and love the positives and things you did. Way to go! Reactivity is really hard and so embarrassing at times! Mr. N is a lot better than he used to be but I still have moments of mortification especially because he's small and (some) people think all small dogs are untrained. It sounds like you've been doing a lot of great work with Ruby! Oh yes, the small dog reputation. I take advantage of it to an extent, because I don't think people actually feel threatened by Ruby, whereas if she were a larger, more intimidating dog we would get a lot more dirty looks. I completely agree with you! Plus, I don't want robot dogs that don't think for themselves, even if at times that thinking might get them into some mischief! Think of how dull our blogs would be without all the mischief! I've always only used positive reinforcement. I wish more people were educated on it. I also wish that more people took responsibility for their dog's actions. It'd be nice if people wanted to take the time to train their dogs and take that responsibility...I can dream. I think we're getting there...it will be a slow process but I truly believe that training philosophies are evolving in the mainstream. Oh, I so agree! ...your photo and in particular the quote you chose is perfect. That will always be one of my favorite books. Thank you for linking to my blog, and I could use the word 'horse' for every 'dog' in this one. ;) I am no a mother to anyone, least of all dogs or horses, I like them 'wild'. And I do believe that I am responsible for them. I just don't need them to pass for girls in a Catholic school. I like the term 'marginally domesticated.' Good for the vet, and fun the rest of the time. P.S. The Little Men say hi to the Un-Corgi girls. Great blog!! My new foster dog has a bunch of issues, including some reactivity issues. We are using so much management right now to get through the day! Makes his life (and my life) less stressful. Training is great and training new behaviors is of course our ultimate goal, but I think a lot of people forgot or are unaware of all of the different management strategies that can be used to prevent "bad" behavior and encourage appropriate behavior. You have such a great attitude! I love that you accept Ruby's imperfections and that you work with her with a loving heart and respect for how far she has come. Not everyone will accept the challenging furkids and vow not to give up on them no matter how long it takes. Kudos! I can not help but love a free dog spirit, and yes, though I want the dogs in my care to always be safe, I also do not want to train all their wildness and independence out of them. Thankfully I'm not a trainer for real and that won't happen, ha! The 3 year old coonhound from the shelter that I've had for 3 months is amazing and has taught me more about dogs than any other, because I knew there were some things I just had to try to teach him... the safe things! New to coming close to properly training a dog, I yelled an, I do that! when I read your "run home" cue. From week one with Valentino I began ending our neighborhood walks with, "Let's go home!" and off we would run home! I pray if he ever cuts loose from me that he will run home! Training is always a work in progress....even more so for cats! A friend of mine has a reactive dog as well, I love your positive attitude and dedication. I have been working with Bain to get him to "focus" during our walks, he gets very distracted by other dogs, he wants to meet them all. I think that the bond with a "bad" dog can become incredibly strong as you help them to learn to cope with the world. Have you read about Grisha Stewart's "BAT" program? I think that what she calls "stealth BAT" made the biggest difference for Shyla, much more than having her focus on me when near triggers or counter-conditioning with treats (in fact, that was impossible at the beginning because she wouldn't even take treats in public). But, every dog is different, and part of training is recognizing what's best for each dog. I have no doubt that you've figured that out for yours! I'm so sorry that I missed this blog hop. I need to put it on my calendar so I am ready next time. I do have the BAT book but haven't read it. I know one of the reactive dog groups I belong to doesn't allow discussion of BAT but I don't really understand why. When I do take treats on walks I get a clearer picture of how stressed Ruby is just about being outside (which is strange since she is always so excited to go on walks) because she will only take treats maybe 1/4 of the time and she takes them very roughly. She gets so overstimulated. Thanks for your story. Your blog is absolutely gorgeous! I love Ruby so much that she seems like a perfect dog to me! But of course, I only know her through your writing, your beautiful still photos and a few videos. I don't know the spinning, barking version, although I'm pretty sure I'd love her too. It hurts my heart a little to read that trainers called her a "tough case." At one of my readings, after I spent a half hour talking about Isis biting someone and never walking properly on the leash, Rob's mom raised her hand and said, "There was nothing wrong with Isis. She was perfect." Ruby's probably pretty perfect too ... but only because she has you as her responsible guardian. Thanks for reminding me about the hop. I hope to join in tomorrow. Yeah, I do think Ruby's pretty perfect. I wish my mom could have met her - she would have agreed! Sorry for the late reply and I'm so glad you joined! I was going to apologize for not commenting on this post earlier this week but I am glad I revisited it after our walk this evening. It was the first break in the rain we've had for days so not only was everyone out but there were also more illegally off-leash dogs out than usual. So my well-trained and frequently exercised dogs (this was our third long walk of the day) went crazy when advanced on by dangerously off leash dogs, of course. And although with three crazed dogs dragging my down the street on their leashes, I would look like the irresponsible dog owner to the uneducated observer, I don't care! I know that my dogs were reacting naturally to a threat caused by actual irresponsible owners. I love this attitude shift I have recently had, the pride I have in my very good dogs, and your post that reaffirms what a wonderfully responsible pet owner I am! Thank you. Thanks so much for visiting, T.J. What kind of dogs do you have? ha ha "bogs" can you guess I meant "dogs"? !